Everybody lies. That’s the truth. But how much and how often? And when do the lines between truth and lies get blurred? I recently read an article in The New York Times about how honesty makes you happier. The author shares how her 6 year old daughter told her that telling the truth made her feel ‘gold in the brain’. What is honesty? If someone asks me “How am I looking?” and I tell her she looks old and fat, is that honesty? When I share my story or update a status on Facebook in which I somehow get perceived as the ‘heroine’, is that honesty? It’s hard to tell. Because every story has more than one version of the truth. What is the truth about honesty? What is the truth about honesty? My writing is a struggle to be authentic without hurting other people. But how can I share my truth without that? In recent posts, I’ve been attempting to be as honest as I can about my relationship with my Mum. I remember writing a post about loyalty being overrated and saying this in response to a comment: I have sometimes observed people being more loyal to a parent/family member after that person has passed. As if somehow in their passing away, they have acquired sainthood! I’m glad to say that I have steered clear of that kind of dishonesty. My Mom was human, just as I am and I’d like to remember and honour her for the woman she was. The dishonesty that I rate the worst is when we lie to ourselves. I fight a hard battle to be honest to myself. Do I always win? No. But I try. I strongly believe in self-awareness and telling myself off. And I’m blessed to have José telling me when I’m being dishonest or inauthentic. I’ve slowly learned to take it from him. Am I always honest and authentic. No, no, no. But I’m aware that it is what I’m called to be and I work at it. What’s your take on honesty? Does honesty feel like ‘gold in the brain’ for you? Brilliant! I so agree, I just sent this quote to a friend and mentioned your blog, her and I were talking about this topic the other day. Someone has been telling her lies, and we know they are lies, yet this person we think truly believe it to be truth. It is a line you have to be careful with. Honesty is so simple at one level and yet can get so very complex. I loved that quote. I have such a terrible memory that I find it easier to stick to the truth :-). The toughest bit, like you pointed out – is to be true to ourselves. Quite often we don’t even know we are being dishonest to ourselves. I think each one us needs to introspect. I learned the valus of honesty the hard way. Once, fresh into youth, i lied to my parents not to hurt them, but one day the lie was got, and that was the worst. That lie didn’t benefit me in anyway, but rather destroyed so many good days and night. After that I try not to lie much. Yes, still at times, it’s tricky not to. What gets me is omission. I think this is a rationalization that the person is not lying but just omitting facts to make their story better, themselves look better or the other person worse or to rally you to their side if they leave out details. I don’t lie except for niceties in a pinch. I have learned to say vague, nonspecific things when asked like that is a pretty color dress or you are lucky to have your children living close, or your grandchild appears to be very responsive! If my honesty hurts someone, it certainly doesn’t feel like gold in the brain if I don’t like something then I reply with a suggestion rather that telling it doesn’t look good… I take the diplomatic way out. It’s another brutally honest post on the relativity of honesty. It’s very important not to lie to the self and do spell out white lies at times when I don’t want to go somewhere. You have explore the whole facade that we put and particularly in our equation with the loved ones who may not be here. Thanks Corinne for pushing us to delve deeper and think about things. Honesty is of big question in this era. And being honest gets a tease always. But being honest to oneself make the person more stronger. Great post, Corinne. Happy that you are trying your best to be honest always. Good questions! Thanks for asking them! I think the most important about honesty is like you said, it’s not black or white – it’s personal where we draw that line and as such we need to be very careful not to judge others on where they placed their own line: what’s acceptable to you, might not be acceptable to them or vice versa. I love being dishonest with myself at times; its a guilty pleasure I accord myself and I wont go into the reasons for doing so as they are very personal!! I know I am being dishonest but allow myself a soak in that bubble to face the hard truth better! Its my go-to stressbuster and not sure if its good or bad but it works for me! Loved this post Corinne as it really asked a very tough question!!!! Oh, yes. I know it well. Thanks for this insightful and slightly uncomfortable post! First line made me laugh out loud! So honest, I thought! Right now I am reading Jaya by Devdutt Pattanaik. Its a retelling of Mahabharata. All throughout the story there are many anecdotes that speak about honesty or lying. In one of the tales however, the reader is left to think if speaking truth and being honest is really good or otherwise! The honesty that can worsen the situation is definitely no good! And at the same time speaking a lie, if it improves the situation and is not far too fetched, then it holds ground! There is honesty and there is a white lie – like the one about telling someone they look lovely. Both have their place. 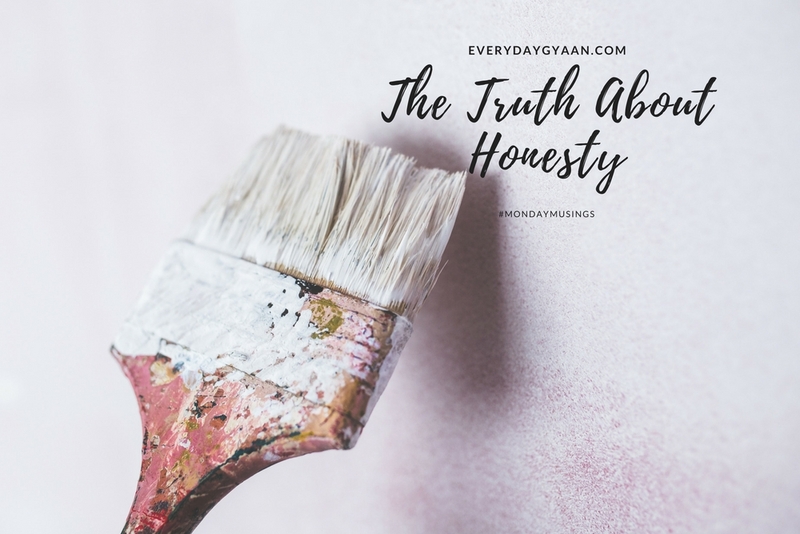 Honesty with oneself is so much trickier sometimes, and I’m sure it’s something that most of us struggle with – not many are open about admitting it, though! But yes I agree warming some one up and saying you look good, is great- to keep their heart. But overdoing it is wrong. I also feel, if someone is right it’s ok to compliment them truly! It tricky this whole concept of honesty. I think some lies are fine when they are told to shield someone from getting hurt. But all of these only when you can still look into your eyes in the mirror. I find myself steering away from the truth only when it may hurt someone. And that sometimes turns to be my mistake and leads to all kinds of misunderstandings.